If you’re online shopping for an electric vehicle charger, there’s some essential information you’ll probably need — including a bit of clarification on what you’re seeking and what your household can support. First of all, you most likely won’t really be purchasing a “charger”; rather, you’ll be selecting a device which connects your electric vehicle to an electrical grid — through which your vehicle can charge up once it’s plugged in. 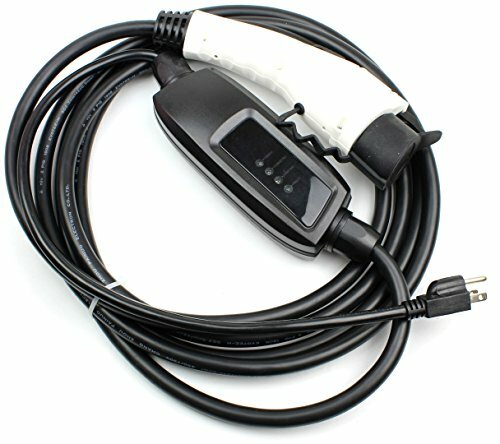 The charging unit itself, found within your EV, adapts most commonly to either a 120v or 240v connection in the U.S.– and you should know which before beginning your search. You should also clarify whether your household can support an additional 40 amp service connection (at a minimum), since that is the necessary rating for a 30 amp Electric Vehicle Service Equipment, or EVSE. 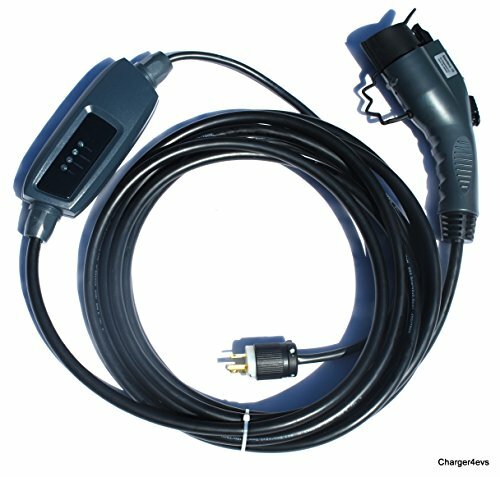 In addition, you’ll want to consider whether you’d prefer a basic hard-wired or slightly more expensive portable EVSE (The latter won’t likely be higher than $50 more in price; consider weighing the extra cost against the likelihood you’ll need to relocate or use the unit in different places — like for re-charging your EV while you’re at work or when visiting relatives out of town over the weekend, etc. ), whether you’d like your unit to be Wi-Fi-enabled, and how much cord length you’ll need to comfortably plug in. Finally, you should spend at least a few minutes seeking out any discounts or other incentives offered on charging equipment in your area by visiting the U.S. Department of Energy’s Alternative Fuels Data Center website, where state regulations, vehicle requirements, and other information is updated regularly. Once you’ve got all that covered, you can start your shopping endeavor by checking out the top-rated EV chargers we’ve found on Amazon, along with the pros and cons of each, below. With search results sorted by their Amazon review status, our top contender is this gem from EV Gear. Boasting 13 reviews, this charger averages a 4.8 star rating out of 5 stars possible, with 85 percent rating at a full 5 stars and 15 percent giving 4 stars. No lower ratings were given at the time of this writing. As described in advertising, this is a portable charger, is sufficient for both electric and hybrid vehicles, and works efficiently with ALL types of electric vehicles — including but not limited to the Chevy Bolt, Chevy Spark, Toyota Prius Prime, Prius Prime, Toyota Rav4 EV, Nissan Leaf, Mercedes B Class Electric Drive, Cadillac ELR, Mitsubishi iMiev,BMW i3 and i8 and iSeries, Hyundai Ioniq, Kia Soul EV, Fiat 500e, Honda Accord Plug-In Hybrid, Honda Fit EV, Ford Focus Electric, Ford C-Max Energy, Ford Fusion Energy, Porsche Cayenne S-E, Porsche Panamera S-E, and Tesla Models S, 3, and X (with a Tesla supplied adapter required). Charging speeds range up to 11 miles per hour, a 3 year warranty is provided, and the kit includes a convenient and flexible 30 foot cable. 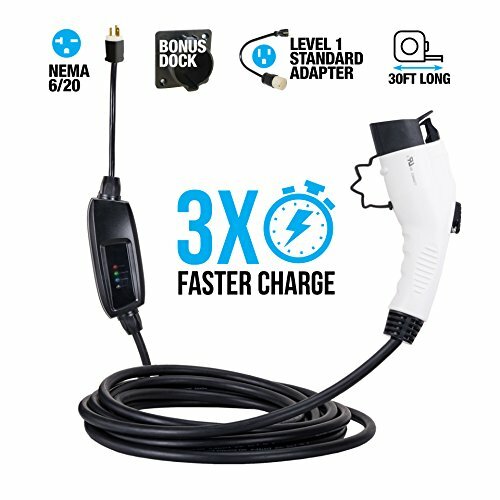 This electric charger comes in at second place on the search results we sorted by Amazon review ratings with verified purchase, (with a close 3rd awarded to this similar Maxx-16 charger). Critical reviews named functioning difficulties as the primary reason for low ratings. Out of its 5 customer reviews, 80 percent rated this charger at a full five stars while 20 percent gave it 4 stars. No lower ratings were given at the time of this writing. This item is described in advertising as pre-assembled, ready to use straight from the shipping box, with indicator lights to ensure an accurate connection, and a 24 foot cord included. Tesla models will require an adapter with this charger.